Please wait for the flash player to load the scribd document below. It takes time and sometimes doesn't load the images within the scribd viewer, thus i recommend you to download the pdf and view it. And other than the wajibat and arkaan and the prohibitions enforced upon a Muhrim during his state of Ihraam, every other thing is sunnah mu`akkadah and leaving the adhkaar or dhikr is not a sin if one ends up forgetting what to recite while climbing safa or similar sunnah adhkaar during `Umrah. 1) When you are going to finish your 7th circuit of tawaaf , i.e the last one then when you reach the hajr aswad (black stone) there is no need to again kiss the black stone or say Bismillah allahu Akbar by raising your right hand palm towards the stone. Because that is done to begin a new circuit and here you have finished 7 circuits so no need to do that again. 2) Likewise in safa wal Marwa. The du`a recited at the top of safa and marwa while facing the qiblah is not to be done at your last standing on Marwa because your 7th circuit would end at marwa so here you do not have to face the qiblah and recite the du`as again. 3) You can put atar on your BODY (only, and not clothes) before wearing the Ihram clothes , whether you put it right after shower at your home, airport, or at the meeqat for those travelling by road, it doesn't matter. Meaning until and unless you don't enter the state (haal) of ihraam you are allowed to put perfume but on your body only. Say you are at the meeqat and taking a shower . After shower you put the `atar on your BODY ONLY and then wear the two white pieces of cloth . Then you come out of the shower rooms , face the qiblah and then make a niyah of Ihram by saying Labbayk Allahumma `Umrah or Labbayk allahum Hajj (whatever you are doing `umrah or hajj) and now once you have said this, you have entered the state of Ihram and thus any perfume be it on body or on clothes is haraam until you come out of the state of Ihraam. Note: both during tawaaf and sai one can make du`a in any language he pleases. 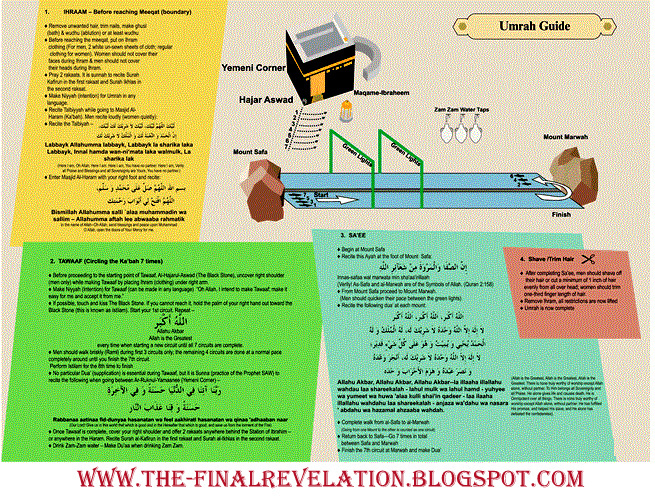 See the Umrah document above for details. 10) If during tawaaf you break your wudu say during your 3rd circuit then according to one opinion of scholars you leave, make wudu and rejoin and continue from where you left and according to another you start the 7 circuits again. Great post! Really informative and very useful post in your blog. I like it. Thanks a lot for sharing. MASH ALLAH very informative and very useful post! I like it. Thanks a lot for sharing. MASHA ALLAH nice post! Thanks a lot for sharing. The points are very much informative for me. Thanks a lot for sharing. Very nice Umrah blog and so informative Thanks for sharing us. Keep it up!